We've come up with a list of scenarios that you can use to test hardware-based isolation in your organization. You can see how an employee would use standalone mode with Application Guard. Restart the device, start Microsoft Edge, and then click New Application Guard window from the menu. Wait for Application Guard to set up the isolated environment. Starting Application Guard too quickly after restarting the device might cause it to take a bit longer to load. However, subsequent starts should occur without any perceivable delays. 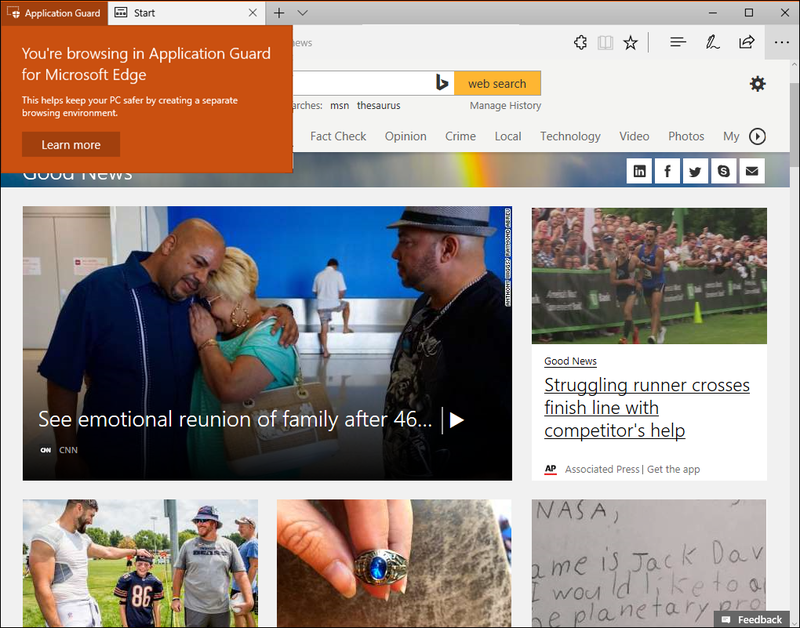 Go to an untrusted, but safe URL (for this example, we used msn.com) and view the new Microsoft Edge window, making sure you see the Application Guard visual cues. 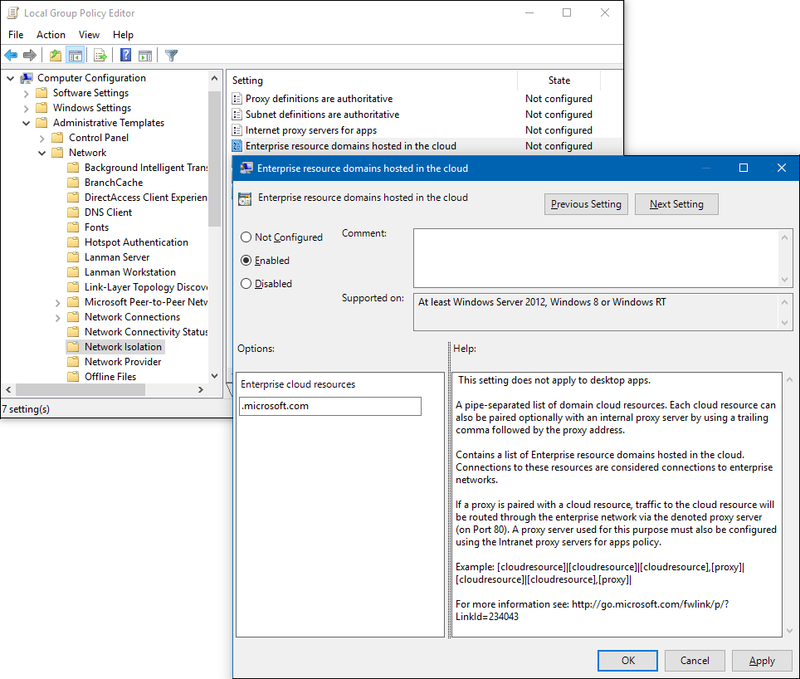 How to install, set up, turn on, and configure Application Guard for Enterprise-managed mode. Before you can use Application Guard in enterprise mode, you must install Windows 10 Enterprise edition, version 1709, which includes the functionality. Then, you must use Group Policy to set up the required settings. Restart the device and then start Microsoft Edge. a. Click on the Windows icon, type Group Policy, and then click Edit Group Policy. b. Go to the Administrative Templates\Network\Network Isolation\Enterprise resource domains hosted in the cloud setting. c. For the purposes of this scenario, type .microsoft.com into the Enterprise cloud resources box. d. Go to the Administrative Templates\Network\Network Isolation\Domains categorized as both work and personal setting. e. For the purposes of this scenario, type bing.com into the Neutral resources box. 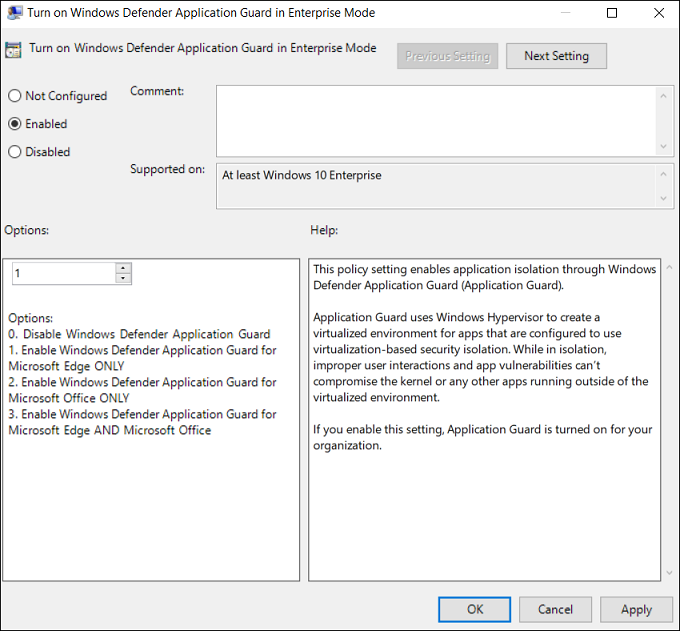 Go to the Computer Configuration\Administrative Templates\Windows Components\Windows Defender Application Guard\Turn on Windows Defender Application Guard in Enterprise Mode setting. Click Enabled, choose Option 1, and click OK. Enabling this setting verifies that all the necessary settings are properly configured on your employee devices, including the network isolation settings set earlier in this scenario. Start Microsoft Edge and type www.microsoft.com. 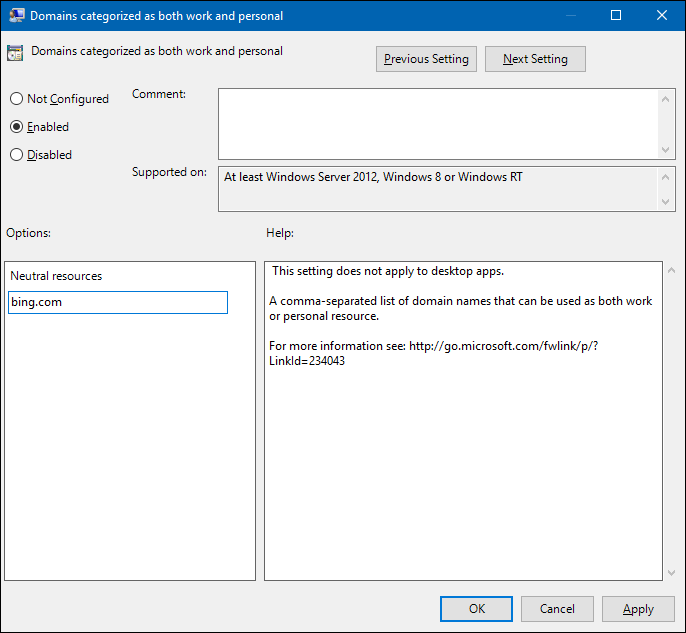 After you submit the URL, Application Guard determines the URL is trusted because it uses the domain you’ve marked as trusted and shows the site directly on the host PC instead of in Application Guard. 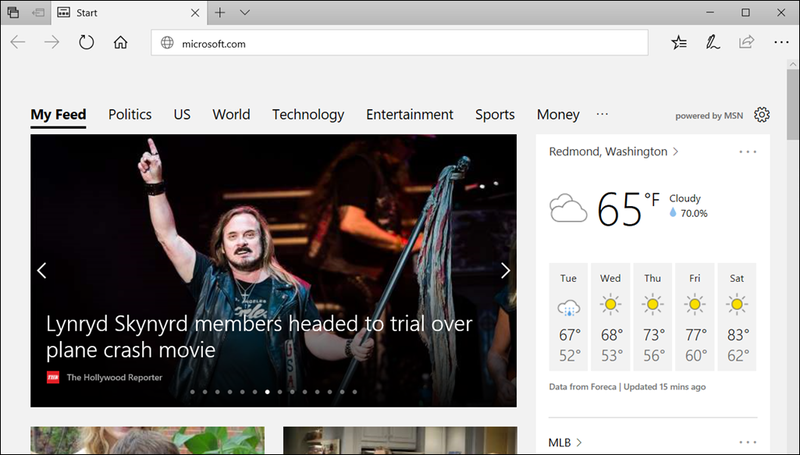 In the same Microsoft Edge browser, type any URL that isn’t part of your trusted or neutral site lists. After you submit the URL, Application Guard determines the URL is untrusted and redirects the request to the hardware-isolated environment. Application Guard lets you specify your configuration, allowing you to create the proper balance between isolation-based security and productivity for your employees. No copying and pasting between the host PC and the isolated container. No printing from the isolated container. No data persistence from one isolated container to another isolated container. You have the option to change each of these settings to work with your enterprise from within Group Policy. 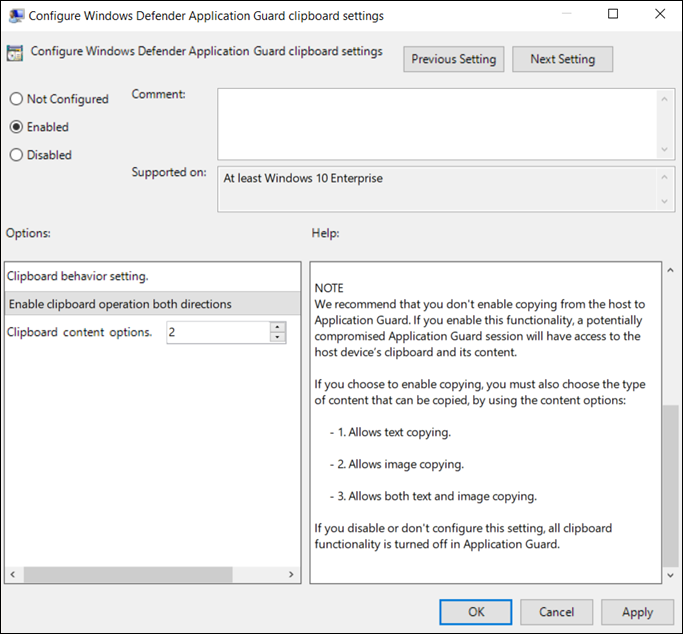 Go to the Computer Configuration\Administrative Templates\Windows Components\Windows Defender Application Guard\Configure Windows Defender Application Guard clipboard settings. 1. Only text can be copied between the host PC and the isolated container. 2. Only images can be copied between the host PC and the isolated container. 3. Both text and images can be copied between the host PC and the isolated container. 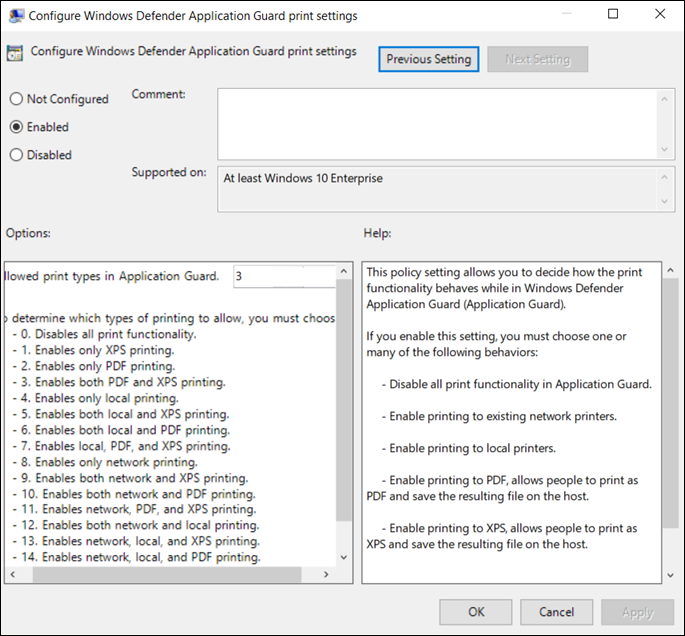 Go to the Computer Configuration\Administrative Templates\Windows Components\Windows Defender Application Guard\Configure Windows Defender Application Guard print settings. Based on the list provided in the setting, choose the number that best represents what type of printing should be available to your employees. You can allow any combination of local, network, PDF, and XPS printing. 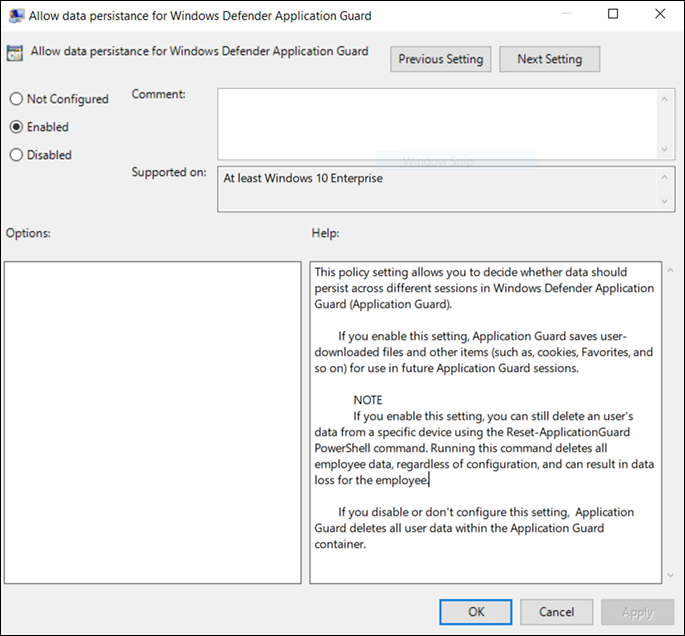 Go to the Computer Configuration\Administrative Templates\Windows Components\Windows Defender Application Guard\Allow data persistence for Windows Defender Application Guard setting. Open Microsoft Edge and browse to an untrusted, but safe URL. The website opens in the isolated session. Add the site to your Favorites list and then close the isolated session. Log out and back on to your device, opening Microsoft Edge in Application Guard again. The previously added site should still appear in your Favorites list. If you don't allow or turn off data persistence, restarting a device or logging in and out of the isolated container triggers a recycle event that discards all generated data, including session cookies, Favorites, and so on, removing the data from Application Guard. If you turn on data persistence, all employee-generated artifacts are preserved across container recycle events. However, these artifacts only exist in the isolated container and aren’t shared with the host PC. This data persists after restarts and even through build-to-build upgrades of Windows 10. If you turn on data persistence, but later decide to stop supporting it for your employees, you can use our Windows-provided utility to reset the container and to discard any personal data. 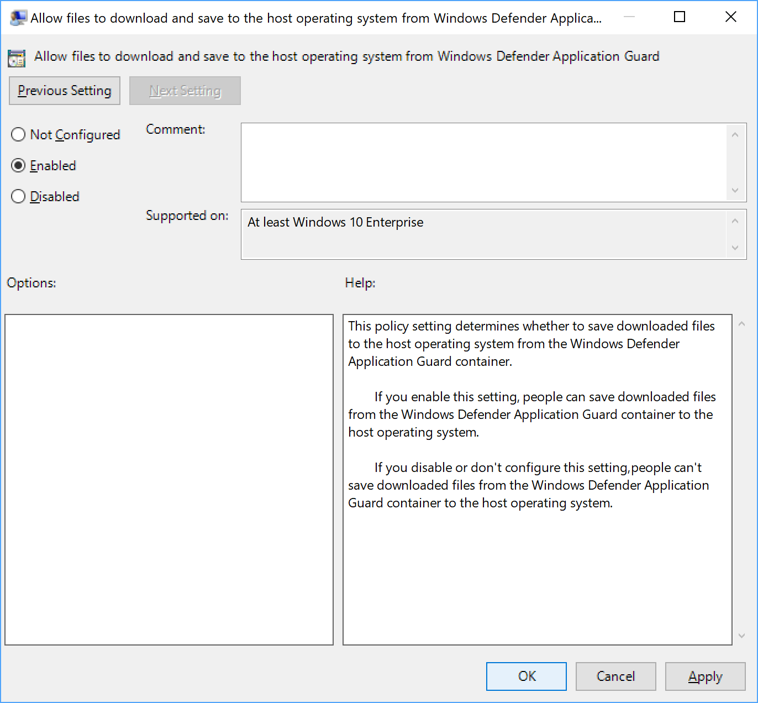 Go to the Computer Configuration\Administrative Templates\Windows Components\Windows Defender Application Guard\Allow files to download and save to the host operating system from Windows Defender Application Guard setting. Download a file from Windows Defender Application Guard. Check to see the file has been downloaded into This PC > Downloads > Untrusted files. 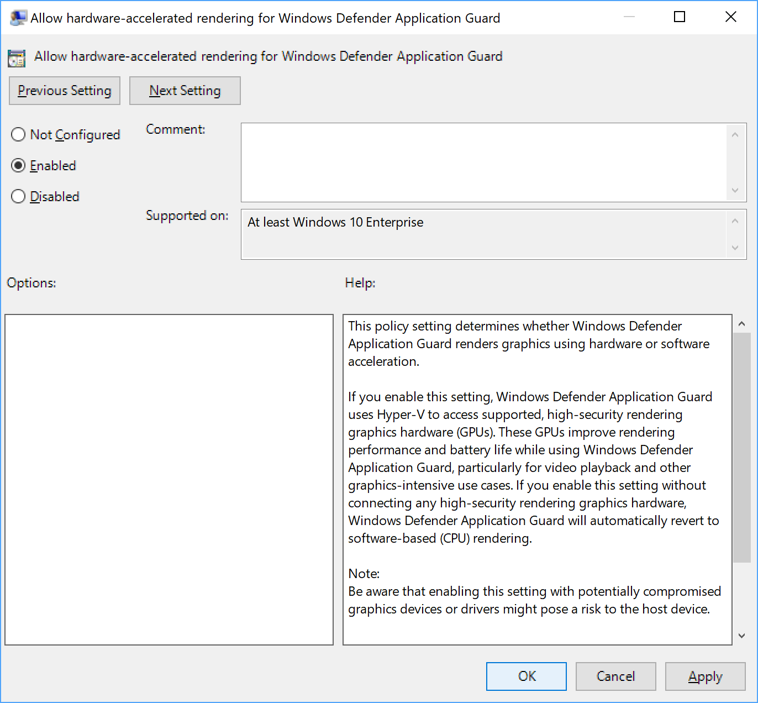 Go to the Computer Configuration\Administrative Templates\Windows Components\Windows Defender Application Guard\Allow hardware-accelerated rendering for Windows Defender Application Guard setting. Once you have enabled this feature, open Microsoft Edge and browse to an untrusted, but safe URL with video, 3D, or other graphics-intensive content. The website opens in an isolated session. Assess the visual experience and battery performance. 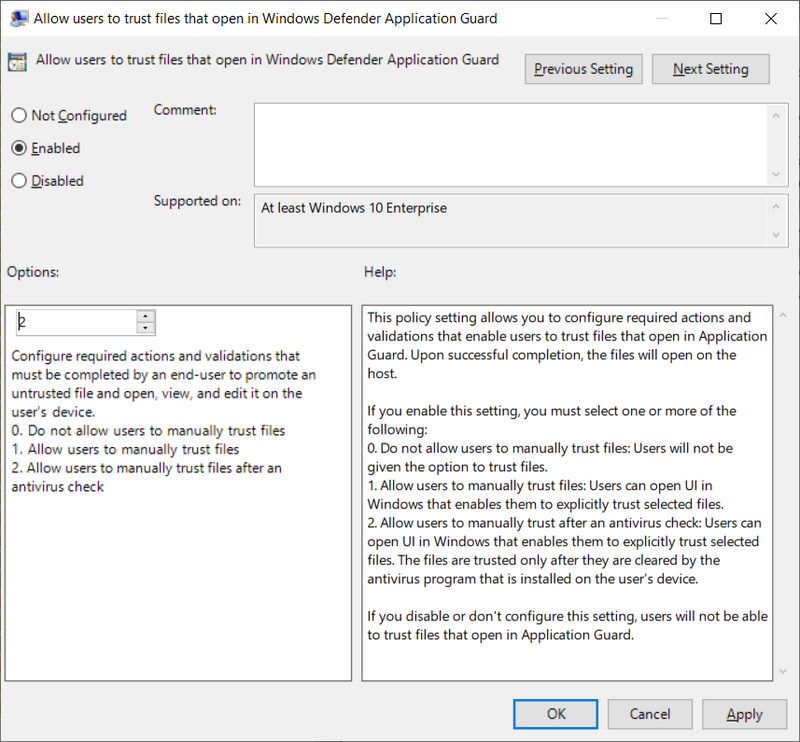 Go to the Computer Configuration\Administrative Templates\Windows Components\Windows Defender Application Guard\Allow users to trust files that open in Windows Defender Application Guard setting. Click Enabled, set Options to 2, and click OK.
Open a file in Edge, such an Office 365 file. Check to see that an antivirus scan completed before the file was opened. 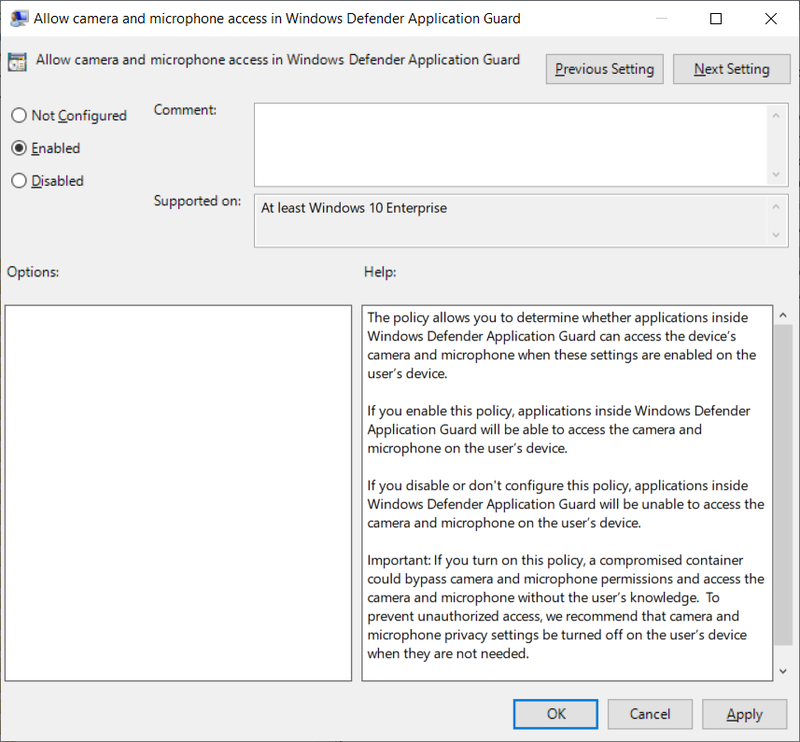 Go to the Computer Configuration\Administrative Templates\Windows Components\Windows Defender Application Guard\Allow camera and microphone access in Windows Defender Application Guard setting. 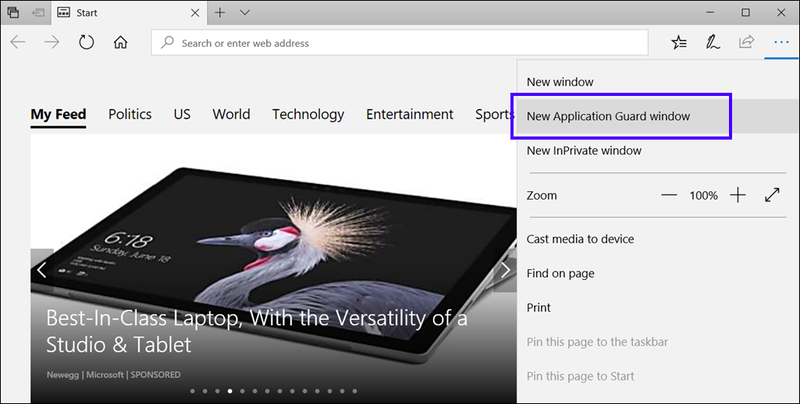 Open an application with video or audio capability in Edge. Check that the camera and microphone work as expected. 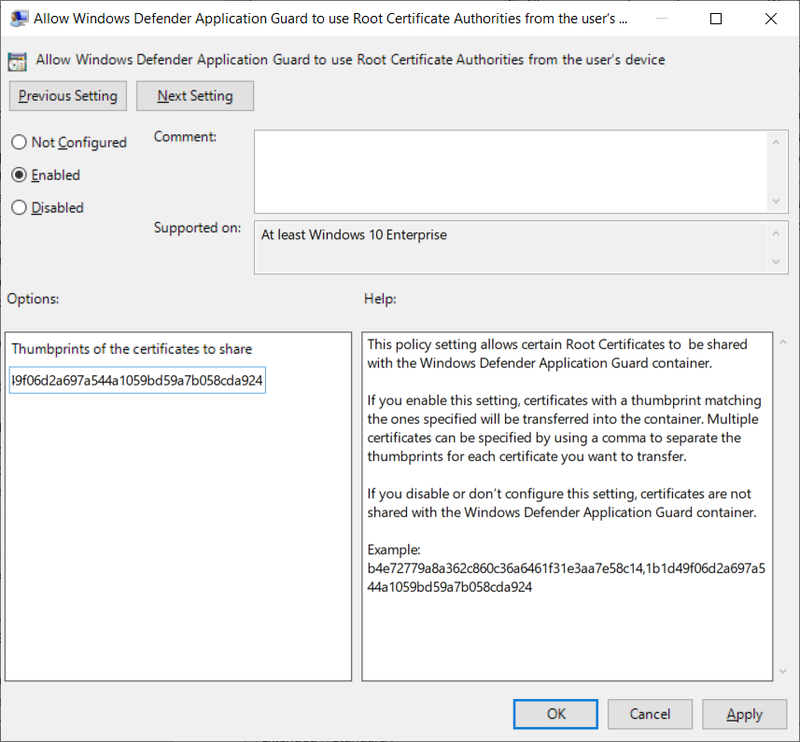 Go to the Computer Configuration\Administrative Templates\Windows Components\Windows Defender Application Guard\Allow Windows Defender Application Guard to use Root Certificate Authorities from the user's device setting. Click Enabled, copy the thumbprint of each certificate to share, separated by a comma, and click OK.